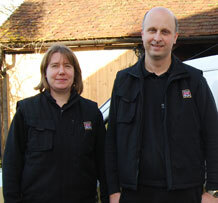 Phil and Ruth have been working together running their Snack in the Box franchise for 16 years. Phil has mostly been self-employed. "I just don't like to work in an office and prefer being out and about", Phil told us. Ruth was a nurse before she joined Phil to run their franchise. Apart from wanting to be out and about and working for himself, Phil looked at a wide variety of franchise businesses. He originally found out about Snack in the Box from the Franchise Magazine. He chose Snack in the Box as he was able to be outside and travelling around rather than be office-based and be his own boss. Phil explains that they were also able to work as a couple - they always knew they didn't want to employ staff in any franchise they took on, so the Snack in the Box franchise suited them well. Ruth added that once Phil had chosen Snack in the Box, she was immediately convinced it was the right one for them. "After all", said Ruth, "how easy can it be to sell a chocolate bar! Everyone loves chocolate!" Ruth added that having repeat business each week from regular customers was also very important for them as it was regular income. She also felt that the association of Snack in the Box with the major confectionery brands meant that Snack in the Box must be a franchise company with a good reputation. Ruth and Phil have just under 150 customers. At each customer site, they put a new snack box to replace the used one, ensure that their customers are happy, collect the cash and move on to the next site. They service customers over 4 days and then use Friday to catch up, do paperwork, find more customers and take deliveries. Ruth and Phil don't service their customers together as this leaves the other one free to catch up with other aspects of the business and look after their family. Phil explains that on Mondays he tends to get up early and service their customers who are furthest afield. "I get up early and beat the traffic. I know which of my customers are open early and I have tweaked my route to be able to service as many customers as possible in a day." Every evening, they count the day's takings, log it for their customer records and pack boxes for the following day. This takes them about an hour and a half in total. Ruth explained, "Our Snack in the Box business works well for us. We can run our franchise business as a couple and it works well with family life as we have 2 young boys. We are able to see a lot more of our family than if we were both working salaried jobs." Phil and Ruth's customers cover a wide variety of business types. This includes offices, workshops, nurseries and care homes.